on saturday the first of may, a little before seven in the morning, i reached stromboli on the overnight ship from naples. it was a perfect spring morning. the flat sea gleamed like silk. the sky was cloudless. dolphins raced and jumped either side of the ship’s bow as we neared the black triangle of stromboli. i caught one of them in mid-air with my camera. the ship dropped anchor a few hundred metres off the port, turned and backed slowly until it was close enough to put a couple of lines to the quay. the anchor chain was wound in until the ship was firmly held in position and the ramp started to creak down to meet the quay. i was one of the first off, carrying the big rucksack on my back. i hadn’t slept much on the voyage or the previous night but i was filled with excitement and emotion to be back on the island. there were many familiar faces in the throng of people waiting on the quay. i was overjoyed to find my friend pasquale, whom i’d thought was in australia. we greeted each other then he got back to his work. i walked up to the malandrino restaurant and had a coffee and pastry with my friend paolo. then he took me down to his house on the rocks in piscita where i’d spent my first winter on stromboli, and which he was generously lending me for the coming week. alone in the main room, a spacious open cube with white walls and a polished cement floor, i put down my bags and stood still. the familiar sense of arrival and peace swept over me accompanied by the soft breeze passing through the room, the twittering of birds outside and the shushing of the waves on the little black-sand beach below. i organised my belongings, changed into shorts and sandals and walked out onto the terrace to look out over spiaggia lunga and breath the sweet air. thus began the last day of my old life. i spent the rest of it wandering around the island, catching up with friends, seeking out people i hadn’t seen in a long time, reacquainting myself with beloved places, piecing together what had changed in the six months since my previous visit. the first of may is the “festa dei lavoratori” throughout italy, the workers’ day celebration. on stromboli there’s a big party at the port in front of one of the main restaurants with music and free food and drink for everyone. it’s the last big community celebration before the summer tourist season takes over. i knew lots of my friends would be there but by the evening i felt so tired it was hard to summon much enthusiasm for the walk across the island. i sat reading in my kitchen by the light of a candle, soothed by the waves and flickering flame. but in the end i put on my shoes, extinguished the candle and set out for the port, intending to show my face briefly then return. the party was already in full swing when i arrived. a couple of hundred islanders were dancing and making merry to a band whilst the air was filled with smoke from a row of big charcoal grills on which meat was being cooked. i collected a glass of wine, spoke to some friends and danced half-heartedly. in my memory the picture of what happened next is that the crowd parted and a smiling young man walked towards me through the middle. i didn’t know him but the family resemblance prompted me to ask “are you matteo sforza, luigi’s brother?”. an hour later we were at the end of fico grande’s ruined old jetty, kissing. the days that followed were sublime. matteo was working in a shop during the day. in the evening he would come to my house where we would eat dinner, play music, talk and dance. towards the end of the week we took the hydrofoil to lipari together to visit matteo’s older sister anna. the last evening carried the heaviness of everything we were trying to avoid thinking about. all too soon it was time for me to board the hydrofoil to milazzo and watch matteo’s face shrinking to a speck on the quay. i felt numb. matteo had talked of visiting london in october but it seemed distant and unreal. three weeks later matteo arrived in london with his over-stuffed suitcases. i met him at the airport and led him back joyously to my house in dalston. we haven’t looked back since. here are the photographs from that enchanted week on stromboli when i met him. i finally got round to uploading two sets of photos from my trip in may to sardegna and the abandoned prison island of asinara which i wrote about at the time. there are thirteen photos from alghero and the stintino peninsular, then eighty-four pictures from asinara exploring the crumbling prison buildings, the abandoned village at cala d’oliva and the breathtakingly wild coastline where it feels like no human foot treads for months at a time. a couple of weeks ago i made a last-minute escape to sardegna with henry. it’s more than a decade since we last went traveling together so it was high time. we were only there four days but it felt like a couple of weeks. mostly we were far from civilisation scrambling around the rocky coastline, swimming in the clear water, or walking in the interior where few tourists tread. rather than write about the journey i’ve put together a montage of film clips taken while we were traveling. this is a medium where i still feel like a child with little grasp of grammar or rhythm. but i shall only learn by making things. i welcome any comments. seated on a rock in the mirror-flat sea several feet from the shore. i leapt here from the white sand beach of cala sabina, ghostly pale under the half moon. the limbs of the bay stretch in from either side, silhouetted against the star-spattered sky. the nearest artificial lights twinkle on the coast of sardegna twenty-five miles away. i can make out the town of porto torres by the concentration. the only sound is the gentle shush and heave of the water moving against the rock and sand. this island of asinara is one of the most strange and beautiful places i’ve been. it’s ten miles long and five miles wide with a human population of no more than forty. in 1885 the freshly-minted italian government designated it as a high security prison and relocated its community of five hundred shepherds and farmers across the water to sardegna’s nurra peninsular. shortly afterwards a quarantine station was opened for mariners with contagious diseases. during the great war austro-hungarian prisoners of war were interned on asinara. five thousand of them died here. 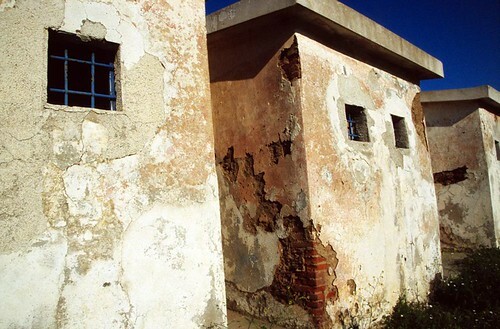 the ethiopean imperial family was incarcerated on the island during the italian occupation of their country from 1936 to 1942. during the 1970s the facility was used to intern high-level mafia criminals. with poetic irony certain of the judges leading the prosecutions against these same figures also took up residence on asinara for their own safety. in 1991 the island was designated a national park. in 1997, after one hundred and twelve years, the penitentiary facilities were closed down and people started being permitted to visit under strict controls. 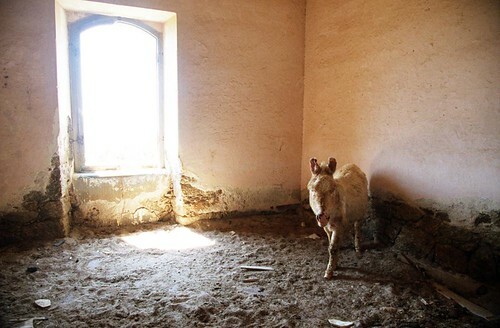 what remains is an environment of astonishingly pure nature punctuated by grim abandoned penal structures. the combination is jarring, emotionally confusing. just two days ago, sitting in the trampery, i decided to escape from london for the weekend and impulsively acquired a return flight to alghero in north-west sardegna. i made no plans for what i’d do once i arrived. claudia kindly sent me a message with a few suggestions. 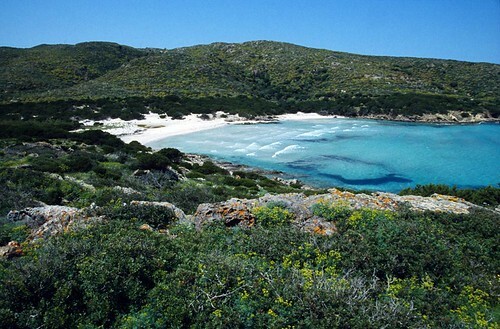 as soon as i arrived i became curious about asinara. in alghera i asked people if there was somewhere i could stay on the island. a lady in the council office said she thought visitors could stay in the old barracks. so i rented a car and drove fifty miles to the tip of the nurra peninsular where i stood looking across to asinara. there was no sign of a quay or ferry so i drove back south to the nearest town, stintino, and picked my way down to the compact harbour. i learned that there was one boat each morning crossing to the southern tip of asinara. someone also had a mobile phone number for one of the people working at the barracks on asinara. it took several attempts to get through but when i did i was told i could stay. not wishing to spend the night in stintino (which felt one-dimensionally touristic) i continued south and arbitrarily took a side road to a tiny hamlet with the fabulous name of noddigheddu. this consisted of seven single-storey stone houses arranged around a green. one of the houses was abandoned and the roof had caved in. an elderly lady called giovanna had two rooms where people could stay. i dropped my bags and continued down the dirt track to the coast. just before sunset i was walking on the long deserted beach when thirteen flamingos appeared magically and noiselessly in the azure sky above me, wheeled slowly around where i stood watching, then returned the way they’d come. this morning giovanna plied me with sardo biscuits and told me some of her family history. her great-grandfather had been a farmer on asinara, part of the community forcibly depopulated by the state in the 1880s. after breakfast i drove back up to stintino and down the track to the quay. the boat was waiting for me. i leapt aboard and we were away across the sparkling water. arriving at fornelli i hitched a lift up to cala d’oliva at the north of the island and dropped my rucksack at the barracks. then i set out on foot and spent the rest of the day walking. except for the three staff at the barracks i haven’t seen another soul. this is a tough landscape of granite outcrops and hardy low shrubs populated by wild donkeys, goats and birds. about five miles north from the barracks i crested a hill to find a jaw-droppingly beautiful view spread in front of me. 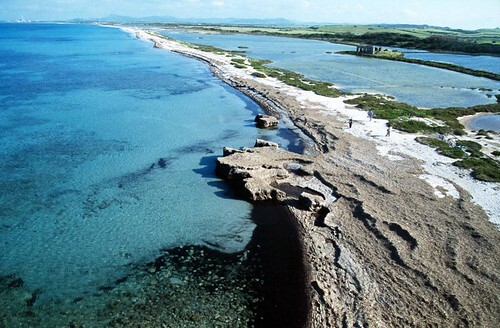 a shallow white-sand beach with turquoise sea breaking against it, low woodland behind the beach, a headland extending to the east surmounted by a crumbling genoese watch tower. this was cala d’arena. i picked my way down through the scrub and reached the beach. there was no sign anyone had been there in weeks. the only footprints were from birds and donkeys. the detritus washed up over the winter remained undisturbed. my excitement at the opportunity to explore and photograph was in conflict with my reluctance to disturb the pristine environment. i trod lightly and sparingly with my heart in my throat. i remembered the excitement in kirmo’s eyes when we walked through ancient untouched forest in lapland. after exploring the beach and the lagoon behind it i picked my way along the rocks to the watch tower then came back over the scrubby headland to the beach. i discarded my clothes and swam in the chill clear water. my first swim of the year. the current was quite fast at the edge of the beach so i did not go out far. later on, back at barracks, i was served dinner alone in the mess. nobody else is staying. then i walked out to the rock where i sit and write now. 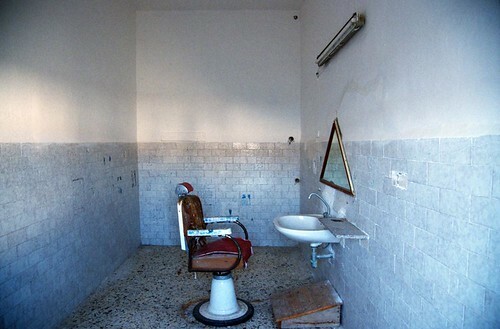 tomorrow i want to hitch a lift down to cala reale to explore the cluster of old prison buildings there. sitting on the plinth of dante’s graffiti-laden statue in the centre of the piazza waiting for maurizio, a talented performer of the city’s traditional music and street theatre whom i met a year ago on stromboli. there’s a band warming up on a stage to my right. the early evening crowd ebbs and flows around me. napoli overwhelms the senses. this decaying, anarchic, spectacular city grips and fascinates me like no other. its vitality is uncontainable. every facet of human possibility is found here, crammed into this this highly unstable patch of ground. i’m huddled in the ship’s bar with irene and her friends, an hour out from stromboli. this journey has so many memories for me. today i’m sharing a cabin with maurizio, on his way back to melbourne to rejoin his girlfriend. yesterday evening i had dinner with gustl and valerie then walked up the mule trail to punta la bronza. the moon was full and the sky was completely clear. the volcano was unusually quiet, expelling a glowing fan of lava every half hour or so. i sat on the helipad for a couple of hours watching a cloud front slowly drift in from the north-western horizon. by the time the wispy outrunner clouds passed across the moon orange flickers of lightning were starting to flash in the distance and it was clear a storm was coming. i did a few sets of yoga sequences, bid farewell to the mountain and started my descent. a few minutes after i got back home an hour later the heavens opened. here i am, fitting myself into a seat in a packed plane at this truly unholy house. karsten dropped by while i was packing this evening and suggested my expectations of getting a couple of hours´sleep were optimistic. he was right. i didn´t get any. thus commences an alarmingly complicated journey. after this flight to palermo i´ll take the train to milazzo, a hydrofoil to stromboli (where i´ll stay a week), then the overnight ship to naples, from where i´ll fly to madrid for a night, then fly to marrakech, drive around morocco for a few days, up to the spanish colony of ceuta on the mediterranean coast, take a ship over the straits to gibralter and finally fly back to london. with any luck i´ll manage to meet a succession of friends along the way. i didn´t intend the trip to be so tortuous, it just gradually got that way. sorting out all the connections has been a nightmare. 13:00 / now seated on an even more crowded train waiting to depart from palermo. this is one of the ancient regional efforts with no air conditioning and seats designed to banish any possibility of sleep (of which i´m in sore need). nonetheless i´m feeling excited. it´s a while year since i was in sicily and it´s wonderful to be back in the midst of the familiar sounds, perfumes and chaos. my first liaison has already gone awry. antonio was due to travel down from tuscany today but he had a run in with a dentist and won´t be coming til tomorrow. meanwhile he´s told me where i can find a key to one of his aunts´ houses on stromboli so i have somewhere to spend the night. 19:44 / perched on the wall overlooking the little port at rinella, on the south-western corner of the island of salina. from where i´m sitting the islands of lipari and vulcano spread out to my left, with filicudi and alicudi to my right. i shouldn´t be here at all but the hydrofoils switched to the winter timetable two weeks early so there was no way to get to stromboli today. rinella was the most remote place i could get to and i´ve never been here before so it was the obvious choice to spend the night. so far nothing is going to plan. i arrived an hour and a half ago, sorted out a room in a deserted hotel by the harbour then swam off the rocks with the sun setting over alicudi. preparations are underway for an open-air theatre performance on the little square above the harbour but it´s hard to predict what my state of consciousness will be by the time the show commences. i´m already hallucinating from sleep deprivation.